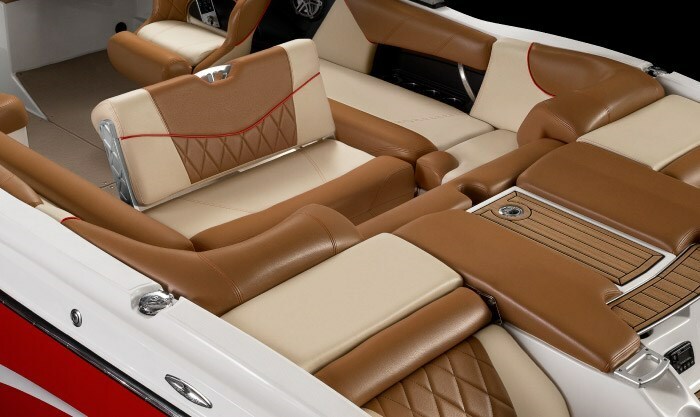 MasterCraft of Vonore, Tennessee, since 1968 has become renowned as a builder of recreational and professional tournament waterski tow boats. 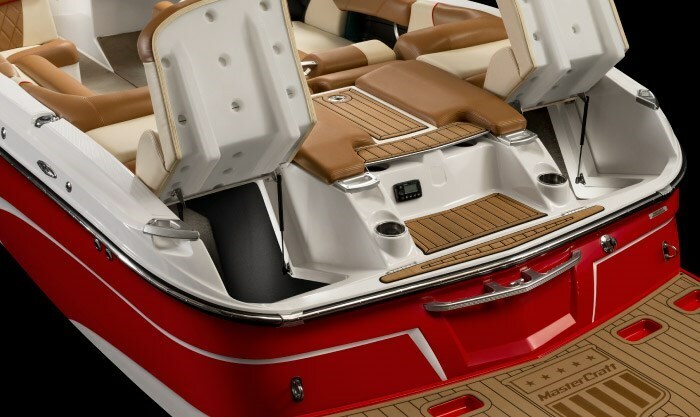 But today’s wakeboard and wake surfers don’t want “the smallest wake” of a waterski boat but instead need large, defined, controllable, and repeatable wakes and MasterCraft has been answering those calls as well. 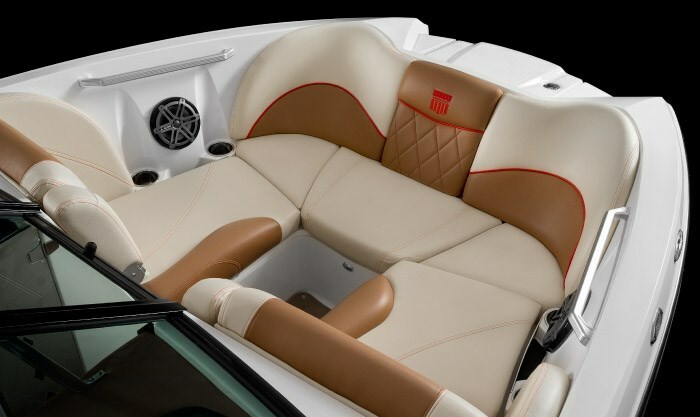 Every Gen 2 Surf System is designed for each individual boat it’s paired to and depends on the individual boat’s hull design, its ballast system, software control, and the wake shaping device beneath the transom that ultimately sculpts the wave. It has four zones of operation starting with Zone 1 for learners up to five feet off the swim platform with a stable waveform right up to Zone 4 which delivers the most vertical lips and steepest face the furthest back to accommodate roaming and bigger boards from 15 to 20 feet off the platform. The X23 provides seating for fifteen with room for four adults within the U-shaped full surround bow seats with flip-down armrests when used for lounging. Finished storage is found below the seats, which on the port side, the seat bottom flips up along with its passenger console backrest to reveal a huge compartment which extends back under the portside rear-facing observer’s seat which also hinges up along with its backrest for access to the same storage area. 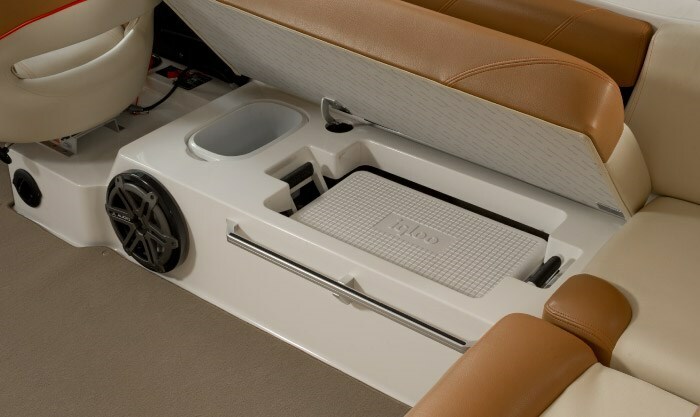 U-shaped wrap-around seating fills the cockpit with storage below plus dedicated storage under the starboard side bench seat for the standard 36-quart portable cooler plus a removable trash container. The two-person centre transom bench seatback tilts forward to permit aft-facing seating. 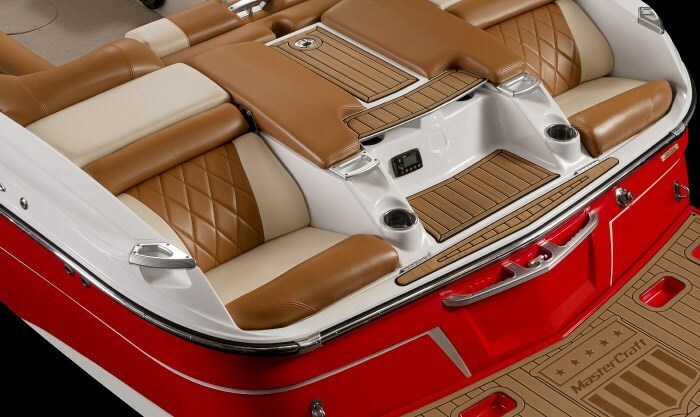 On each side of the outside of the transom are aft-facing jump seats above the swim platform, each of which have adjustable headrests and the seats flip up to reveal additional storage compartments beside the motor compartment. 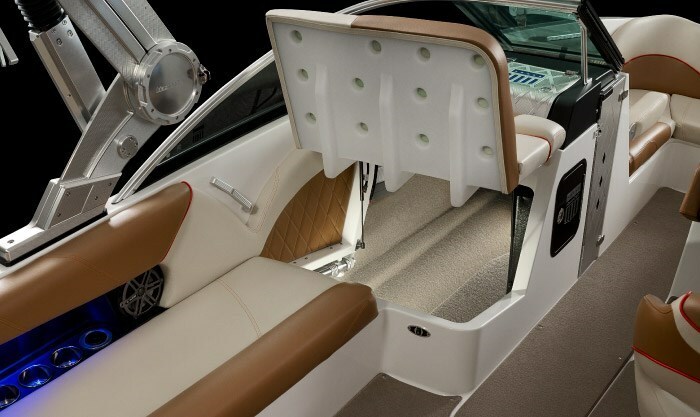 A single sundeck with centre filler cushion covers the top of the transom which, with this cushion removed, provides a centre transom walk-over to the swim platform. An adjustable driver’s bucket helm seat faces a very modernistic but businesslike helm with a four-spoke unidirectional brushed steering wheel with tilt, and full standard instrumentation including all normal engine function gauges plus speedometer, tachometer, depthfinder, air and water temperature, a 4.3” video gauge display system plus Zero Off wakeboard speed control system integrated into this video gauge. A Fusion RA205 stereo with four speakers is also standard. Other notable standard equipment includes inboard power from a 320 horsepower 5.7L Ilmor engine with Vector (V) drive with a V3 ProWake propeller and chrome thru-hull exhaust, a ballast system, wake adjustment plate, a Zero Flex ZFT0 fold-down tower, and a fixed mirror. There are three Ilmor engine upgrades in 382, 430, and 522 horsepower from which to choose along with four option packages plus innumerable available individual options. 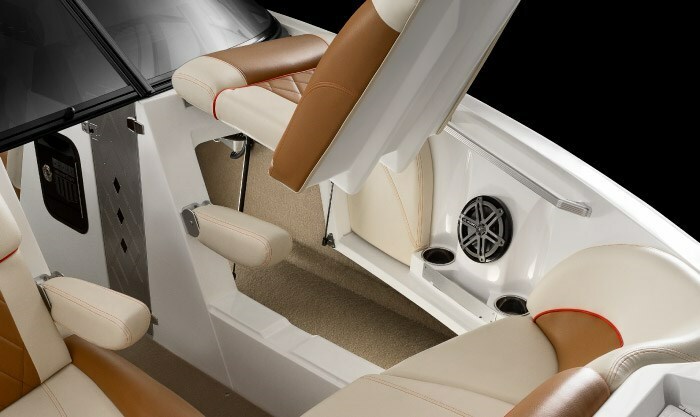 The most appropriate option package is the Surf and Convenience Package which includes the Gen 2 Surf System, upgraded ZFT4 Tower with racks, wake shaping device, attitude adjustment plate, two custom fit ballast bags, bimini cover, boat cover, removable pylon, plus includes the Premium Audio and Touchscreen Package which itself includes an upgraded stereo plus a 7” video gauge touchscreen display. 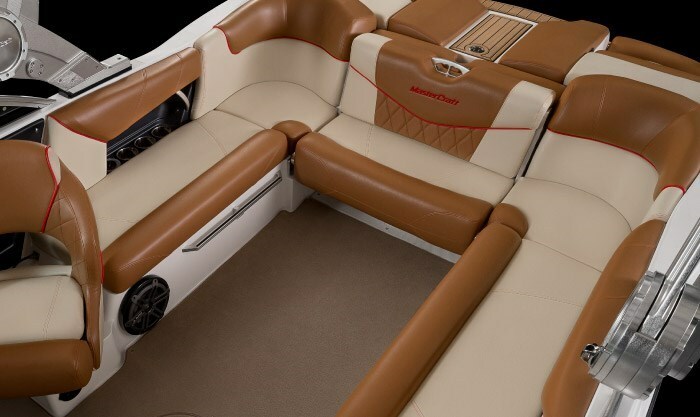 There is a wide selection of hull and interior colour, graphic, and accenting choices plus many canvas options, tower options, a trailer with options, plus comfort and convenience options. The X23 is targeted at recreational wakeboard users at 18 to 22 mph and wake surfing at 10 to 12 mph. If this defines you, then this is the boat for you.